This week is my week to switch my creative hats. 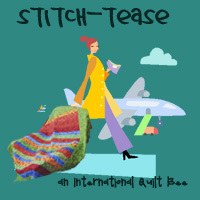 I will not be sewing this week but instead will be working on my scrapbooks. I will be in Seattle all week at my dear friend's house. My friend Monika and I will travel to Mim's where we will eat, talk, drink, talk and oh yeah...scrapbook. Mim and her husband spoil us with their incredible hospitality so it is only natural that I try to spoil her by making a few things that she has hinted at liking. Giving a handmade gift is one of my favorite things to do. Sure, it's easier to buy something but making something, especially something a friend has hinted at that they would like, remains at the top of my list of pleasures. This year I was listening when Mim hinted that she doesn't have any mug rugs. I decided to make her a set of non matching mug rugs, one for each season. 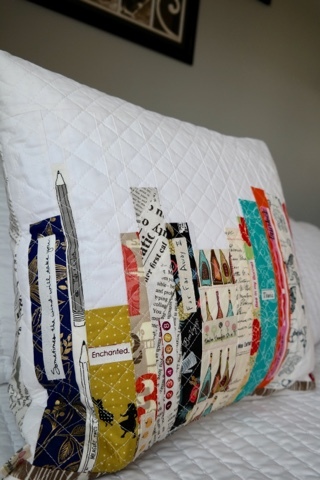 The first was made using Kate Basti's #talltalesblock. 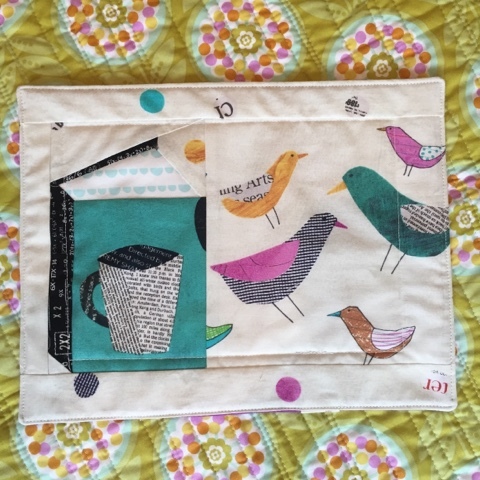 Mim loves to read, so her spring mug rug is a book and birds theme. Summer wouldn't be complete without a yummy ice cream cone. 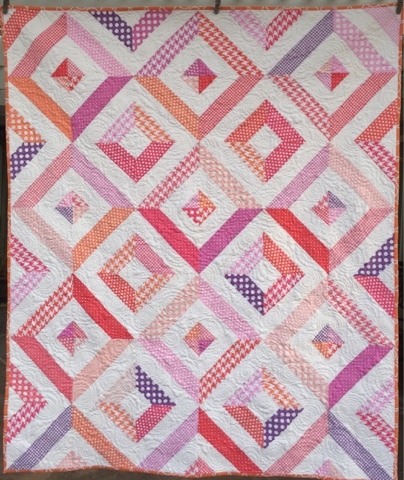 This paper pieced pattern was found on the Freeze Frame blog. For fall...a maple leaf block seemed like the best way to capture fall colors. 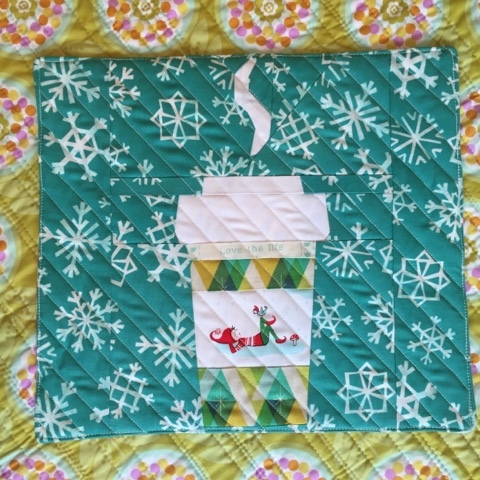 For the winter mug rug I used Amy's #riseandshinecoffeepattern. This is such a fun and versatile pattern. Two years ago I made Mim a Valentine's Day pillow. 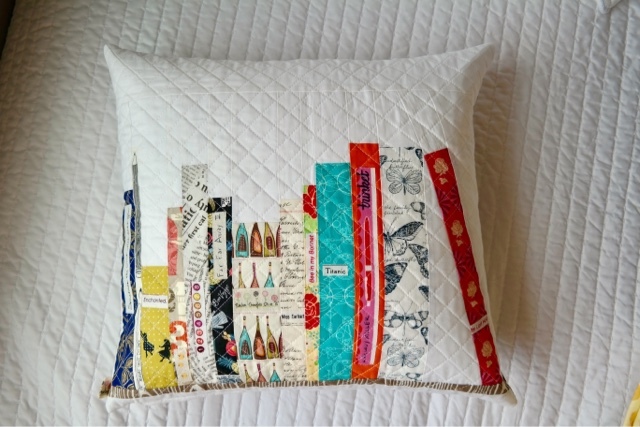 (You can read about it here) This year, knowing she has the pillow form already, I thought it might be fun to make her a reading pillow. This was really fun to make. I started with the cutting guideline from Don't Call Me Betsy's tutorial and then assembled it my own way. It was very fun to cut words from text fabric and use selvedges as book titles. 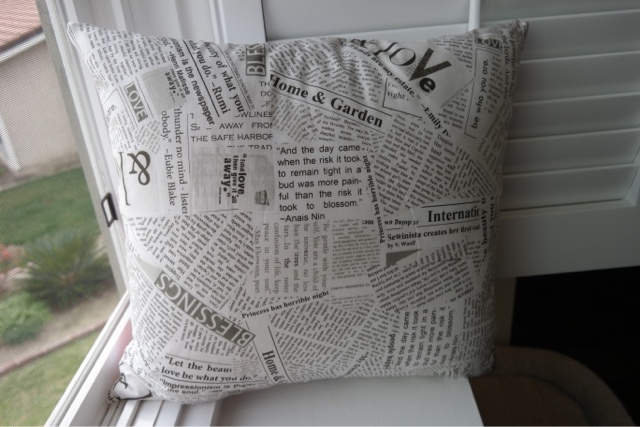 This pillow finished at 20" square. The last thing I made was a coin purse for each of my friends. This pattern is a standard in my rotation of things to make for friends. 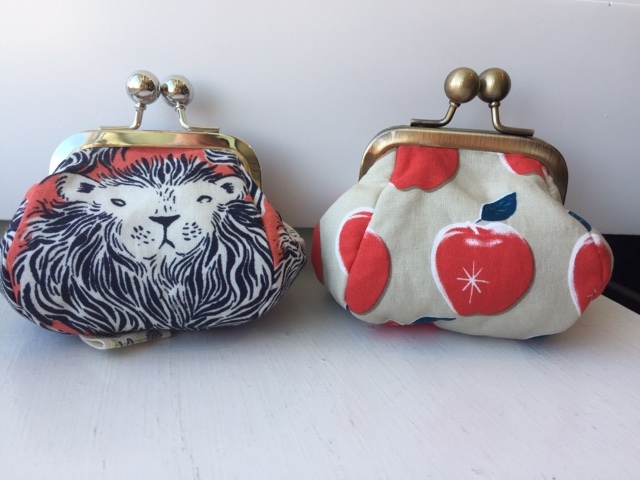 If you haven't tried making a coin purse hop over to Craftsy and grab this pattern. The lion is for Monika and the apples are for Mim. I am looking forward to giving my friends their gifts but I am more excited about spending time with my friends. I will be working on making scrapbook pages using photos from our trip to Ireland, Thanksgiving, Christmas, baby Valko (my newest grandson) and New Year's weekend. I hope I can get all these topics covered. I scrapbook using the Project Life app and then add other digital media to the pages when the mood strikes me. I'll be sharing some of my favorite pages on Instagram as they are completed. Last Saturday I attended the baby shower of a dear friend's daughter and gifted her the quilt I have been working on these last few weeks. 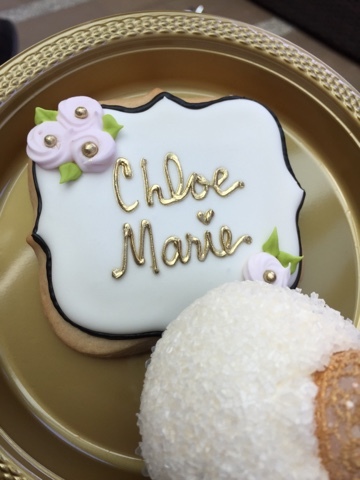 But first I want to share the cute cookies that we were given with the baby's name written on them. They were almost too pretty to eat... but I managed to eat the entire cookie and a chocolate cupcake, too! 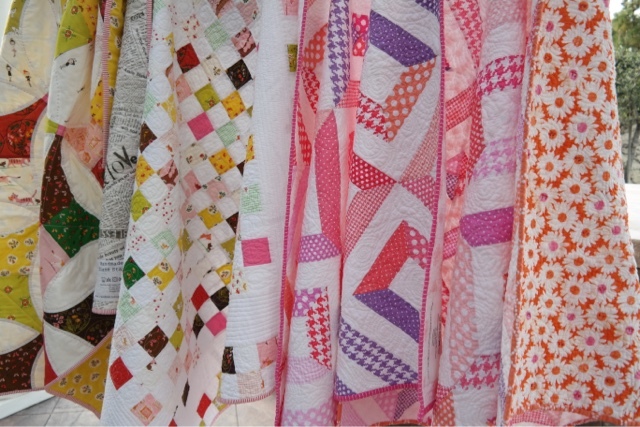 This quilt is made from the leftover fabric of another baby girl quilt I finished last year. 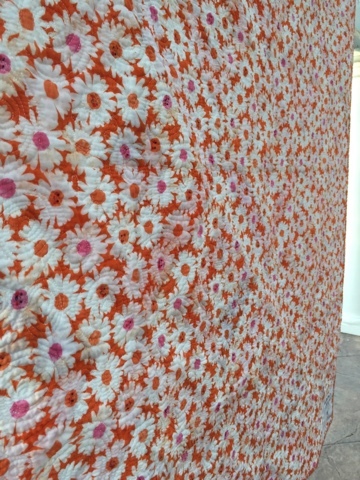 In writing this post I realized that I never blogged about my Flowering Snowball quilt. I posted it in a Finish Along post but didn't write a separate blog post about it. I guess I will need to do that soon. To make this quilt I cut all the 2.5" squares with the electric GO cutter last year at retreat in Wisconsin. I made four patch blocks using white fabric and the colored squares. 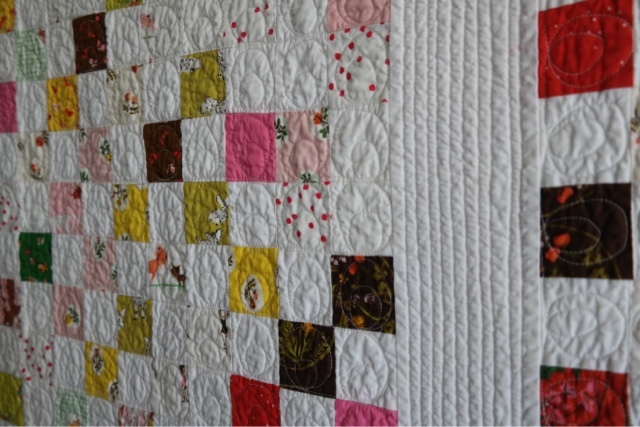 To get the quilt up to what I think is a decent size for a baby I added an inner border of white and then used more four patch blocks as the outer border. 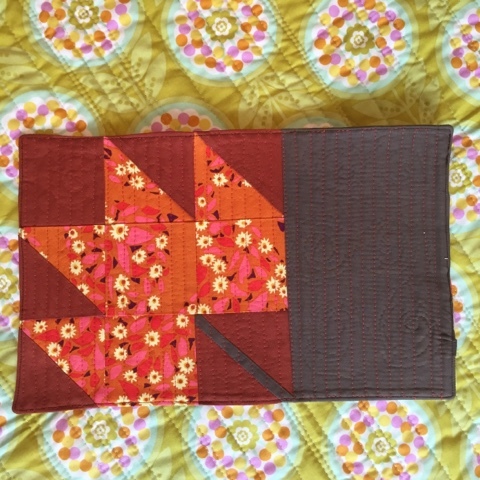 I only had to make four more four patch blocks with additional fabrics from my stash to finish the quilt. 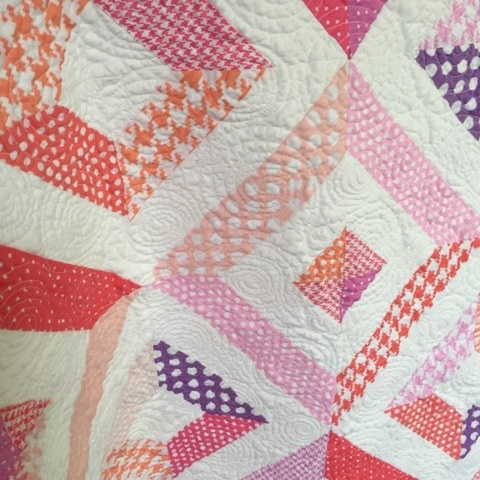 I think my favorite part of the quilt is the quilting motif I used. I recently purchased the Quilter's Planner and it was one of the weekly motifs to practice. 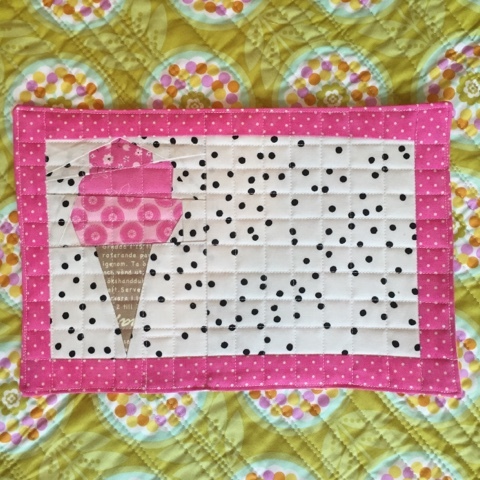 Not only was it easy to make but it gives the quilt a nice texture and leaves it soft and cuddly for the baby. 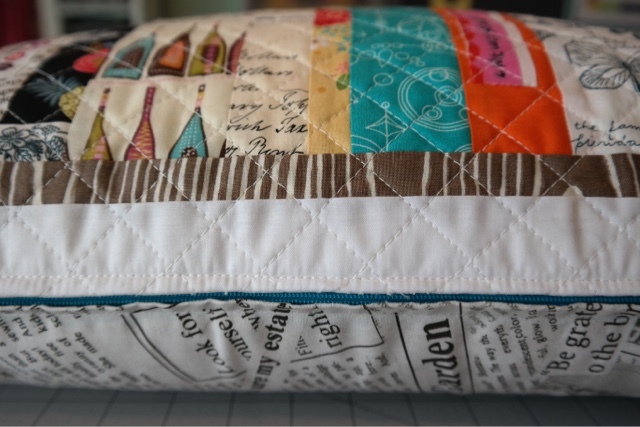 In the border area I used straight line quilting. 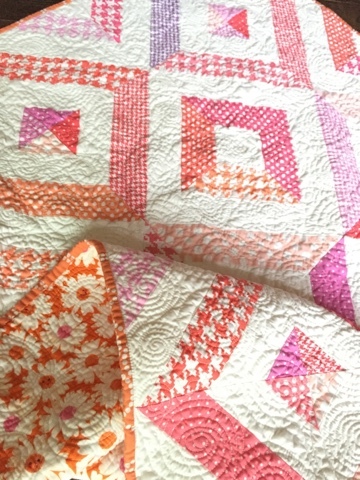 You can't really see it in these photos but the inner white border is quilted with a soft pink thread. 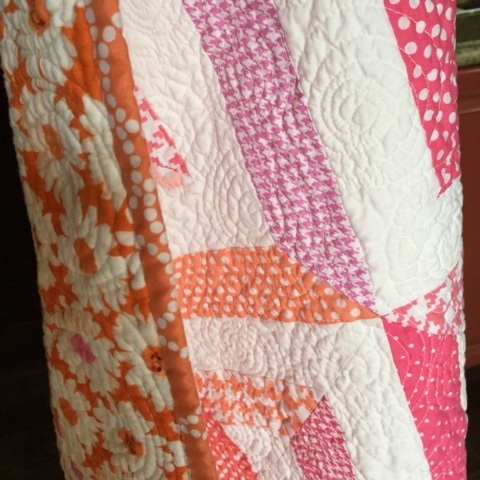 The rest of the quilt is quilted with white thread. The backing and bindings are also some of my favorite fabrics. 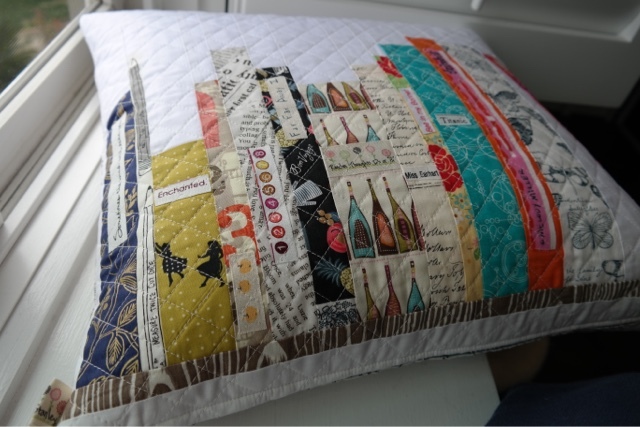 The newsprint by Carrie Bloomston goes with everything and that mini stripe binding was the perfect finish for this quilt. 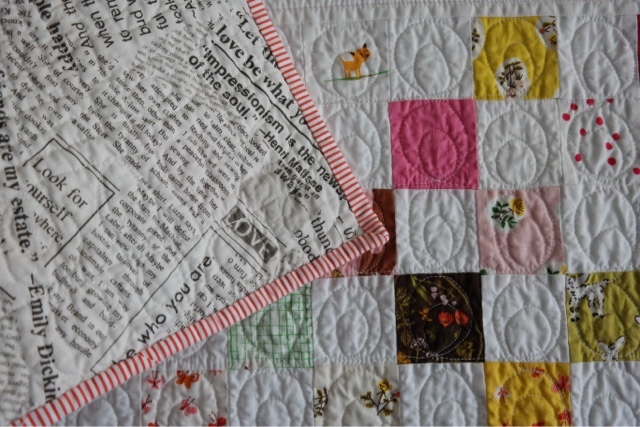 This is the last of four baby quilts I had on my to-do list; all but the flowering snowball has been gifted. 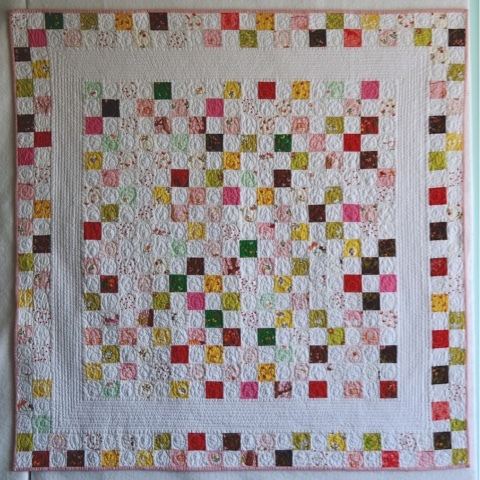 I am saving the flowering snowball quilt for a very special baby girl that has yet to be conceived. 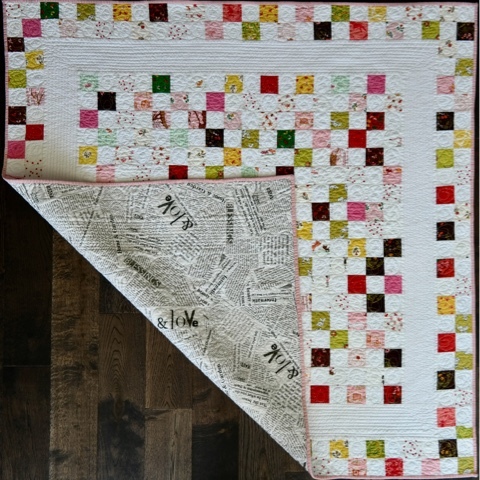 I will share more about that when I blog about this special to me quilt. I have three more friends expecting babies to arrive this summer. It will be the second baby for each of them and they all have a boy as their first child. What are the odds that they will have girls? We will have to wait and see if I will be making more baby girl quilts or the tides will change for baby boys to arrive to my friends.